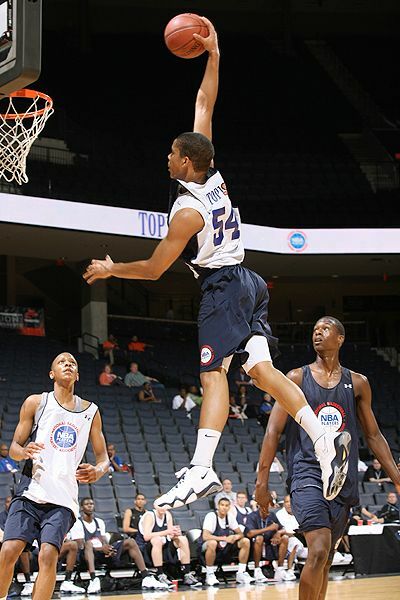 According to numerous sources, erstwhile Class of 2010 commit Andre Dawkins is considering enrolling at Duke one year early. According to the source, Dawkins already had the necessary 16 core classes, a qualifying test score and the appropriate corresponding GPA to be admitted to Duke. Dawkins has been in high school for four years, starting out at Deep Creek High (Va.) in ninth grade before transferring to Atlantic Shores Christian High (Va.), where he repeated the same grade. That was done for basketball reasons, not academics, according to the source. The source with direct knowledge said Thursday that if Dawkins does graduate high school, there is no reason to believe he won’t play at Duke next season. Let’s take a closer look at Andre, who, if he chooses to enroll, will certainly provide talent in addition to much-needed depth in the backcourt next season. We’ll be upfront: Andre Dawkins is Duke’s next superstar shooting guard. Armed with a jumper wetter than J.J Redick in an Indian monsoon and athleticism that likens to Corey Maggette and Gerald Henderson, Dawkins possesses the tools to dominate the ACC. Dawkins’ vertical leap is simply astonishing. He is a constant threat for offensive tip-ins and put-backs, as he often lurks around the rim after the shot. Although his ball-handling needs work, Andre’s physicality and shooting prowess will intimidate defenders for years to come. Having grown up a Blue Devil fan in Virginia Beach, Dawkins is a great recruiter for the program, often getting in the ear of fellow Duke recruits and urging them to commit. Some of his (and our) favorite prospects include: Harrison Barnes, Kyrie Irving, Brandon Knight, and Ray McCallum. Let’s hope his hard work pays off. …I don’t really look at it like that. We’re just gonna come in and try to win games. That’s why they’re giving us the scholarship. We can’t say that we’re the best anything. That’s for guys like you to decide down the line. I don’t put pressure on myself or any of us. We have enough pressure coming to Duke. Until we go out there and prove it, it’s just people talking. Our goal isn’t to be one of the best classes ever. We’re just trying to go there and win games. That’s it. Assuming that Dawkins does in fact enroll early, he will likely take the place of departed Elliot Williams in the rotation, behind Nolan Smith and Jon Scheyer in the backcourt. This will allow Kyle Singler to play in his natural position on the wing, with Mason Plumlee, Lance Thomas, Ryan Kelly, Brian Zoubek, and Miles Plumlee rotating on the block. If anything, Duke will boast one of the deepest frontcourts and most versatile offensive rosters in the ACC and Division I. Get ready, Crazie Talkers. We’re in for a show. Pingback: Crazie Talk » Blog Archive » Breaking News: It’s Official!